The broader Massanutten area has seen considerable additional growth since 1996, particularly outside of Massanutten Village. The Massanutten area now consists of six (6) relatively distinct areas. 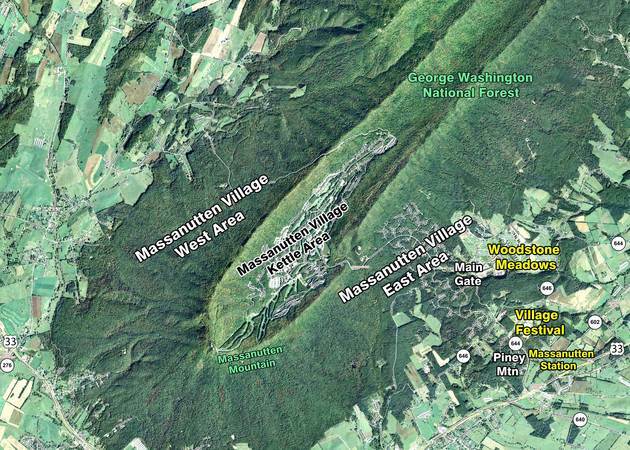 Massanutten Village itself can be divided up into three areas — Massanutten Village West, Massanutten Village Kettle, and Massanutten Village East. Outside of Massanutten Village and to the east, three additional areas have been planned and are under various stages of development — another Residential Planned Community District called Woodstone Meadows and two Planned Commercial Development Districts called Village Festival and Massanutten Station. Understanding the history of these three areas outside of Massanutten Village is very important to understanding the arguments for and against town incorporation of the Massanutten Community. 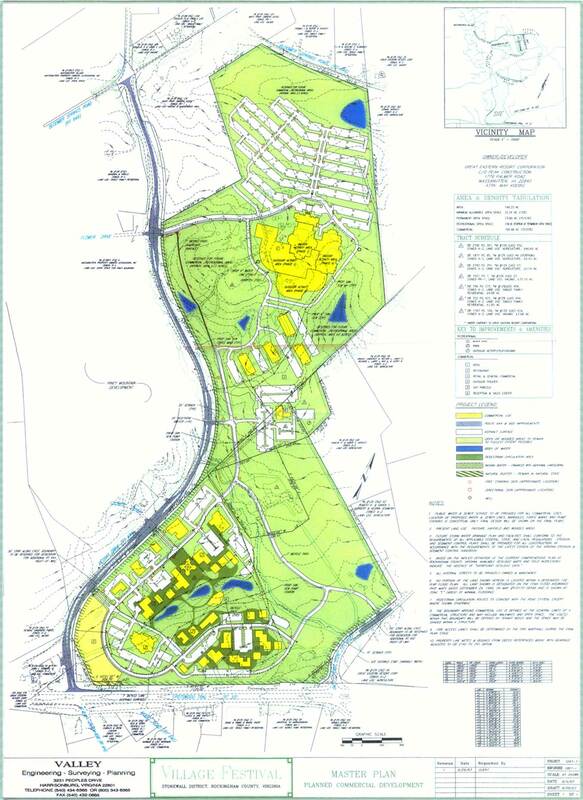 Massanutten Village can be divided into three separate areas largely based on geographical reasons and the types of housing accommodations planned in each area. The Massanutten Village West area consists of planned, but undeveloped land largely owned by Great Eastern Resorts. The only infrastructure which exists in this area is Del Webb Drive which has restricted access from the Massanutten Mountain Overlook to the abandoned gate house at Happy Valley Road in Keezletown. The Massanutten Village East area largely consists of single family home subdivisions for residents who live year round — one subdivision called Piney Mountain is located outside of the limited access gate house northwest of the intersection of Route 33 and Route 644 (Resort Drive). The design of these two areas (East and West) has remained relatively the same since the Massanutten Village Master Plan of 1994. 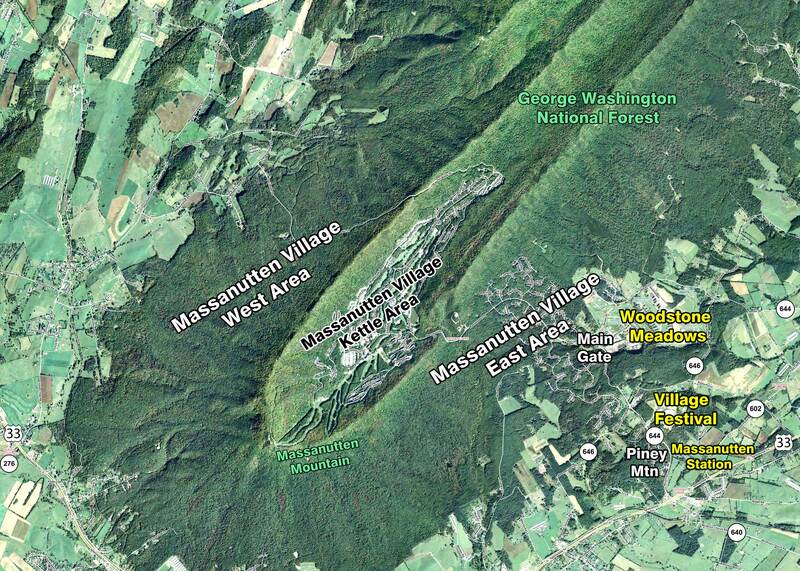 The Massanutten Village Kettle is an area bounded by the «kettle» form of the Massanutten Mountains. This area consists of four private single family home subdivisions; three private multi-family home subdivisions; timeshare units in the form of duplexes, townhouses, and condos; and, resort amenities to include an eighteen hole golf course, miniature golf course, go-kart track, bungee jump, ski slopes, snow tubing hill, zip line, ski lodge, outdoor swimming pools, a general store, a hotel & conference center, a restaurant, an indoor recreational facility with an indoor pool & gymnasium, and administration buildings for MPOA and Great Eastern Resorts. The Residential Planned Community District (R-5) of «Woodstone Meadows» was approved for development by the County Supervisors in late 1995. It is located just outside of the main entrance to Massanutten Village and east of Route 644 (Resort Drive). It should be noted that Woodstone Meadows is not served by MPOA law enforcement or road maintenance services. The original Great Eastern Resorts project design of two-hundred (200) acres featured six-hundred (600) timeshare units along with an executive golf course of nine holes, clubhouse, pro-shop, and a community recreational complex with indoor & outdoor swimming pools, tennis courts, basketball courts, a playground for children, a café, general store, and timeshare sales offices for Great Eastern Resorts. In the year of 2001, the County Supervisors approved expanding the project to a total of three-hundred (300) acres including the total number of timeshare units increased to nine-hundred (900), the executive golf course expanded to eighteen holes with a driving range, and the addition of riding stables and a spa. The project expansion also included a corresponding major expansion of the public utilities of water and sewerage to accommodate the projected future growth outside Massanutten Village. Specifically, the sewage treatment capacity was increased to 1,500,000 gallons per day. In the years of 2003 and 2007, the County Supervisors approved further expanding the project to the present-day project total of roughly 435 acres with 1,700 planned timeshare units for a gross unit density of 3.9 units per acre — the 2011 Woodstone Meadows Master Plan Map is shown on the right. All amenities and public utility expansion have been completed along with roughly 500 of the 1,700 timeshare units. The Woodstone Meadows area also includes single family homes and farms that are not a part of the Great Eastern Resorts project. One single family home subdivision, also called Woodstone Meadows, includes twenty-four (24) dwellings with their own property owners association. Upon completion of the Great Eastern project, Woodstone Meadows will have roughly the same number of housing units as the current number of housing units found in Massanutten Village. It is important to note that the Woodstone Meadows timeshare unit owners and their guests often travel into Massanutten Village to use its amenities such as the golf course, mini-golf, go-kart track, restaurants, and ski slopes. This may be a reason why the number of cars entering into Massanutten Village has increased so dramatically in recent years. The Planned Commercial Development (PCD) District of «Village Festival» was approved by the County Supervisors in January 2005 for development by Great Eastern Resorts. The project is located on 148 acres of land which is east of Route 644 (Resort Drive) and bounded on the north by Route 646 (Bloomer Springs Road) and the south by Route 33. It should be noted that Village Festival will not served by MPOA law enforcement or road maintenance services. The project plan included a recreational indoor-outdoor Waterpark, a time-share sales center, hotel buildings and 150,000 square feet of retail shops all designed specifically for use by the Massanutten Village and Woodstone Meadows timeshare owners and their guests plus visitors to the Massanutten area. The project plan also included major improvements to Route 644 (Resort Drive) widening the road to four lanes from Route 33 to the entrance of the Waterpark just short of Route 646 (Bloomer Springs Road) and straightening it from Route 646 to beyond the Massanutten Village entrance. These road improvements were jointly funded by VDOT, Rockingham County, and Great Eastern Resorts. The public utilities of water and sewerage for the entire project will be provided by Massanutten Public Service Corporation. Project construction began in 2005 on the roughly 80,000 square foot indoor portion of the Waterpark which opened in late 2006. Soon after, the outdoor portion of the Waterpark was completed along with the road improvements to Route 644 (Resort Drive). As of July 2010, the remainder of the project (shown on the right) largely remains undeveloped. However, the County Supervisors did approve an amendment to the project plan in 2008. The southern 68 acre portion of the project planned for the development of 150,000 square feet of retail shops was amended and renamed a separate Planned Commercial Development (PCD) District called «Massanutten Station». The amendment primarily increased the square footage of retail space to 264,000 and included apartments and condominiums above the commercial areas. Specifically, the project elements include: residential units, retail shops, an outdoor amphitheater, a special events community center, a concert hall, an arcade, an open air market, restaurants, a movie theater, professional offices, special enterprises, a wellness/fitness center, an information center, walking trails, and recreation fields. The amendment created a planned mix-use development comprised of retail, entertainment, recreation, and residential uses. Massanutten Station will be managed and maintained by Great Eastern Resorts. As of July 2010, the construction of Massanutten Station had not started. However, Village Festival and Massanutten Station will add to the traffic pattern totals and complexity of the Massanutten area when completed. Timeshare occupants in Massanutten Village and Woodstone Meadows will frequent Village Festival and Massanutten Station commercial areas, likely on a daily basis. Likewise, Massanutten Station residents will frequent the amenities in Massanutten Village and Woodstone Meadows, once Massanutten Station is completed. 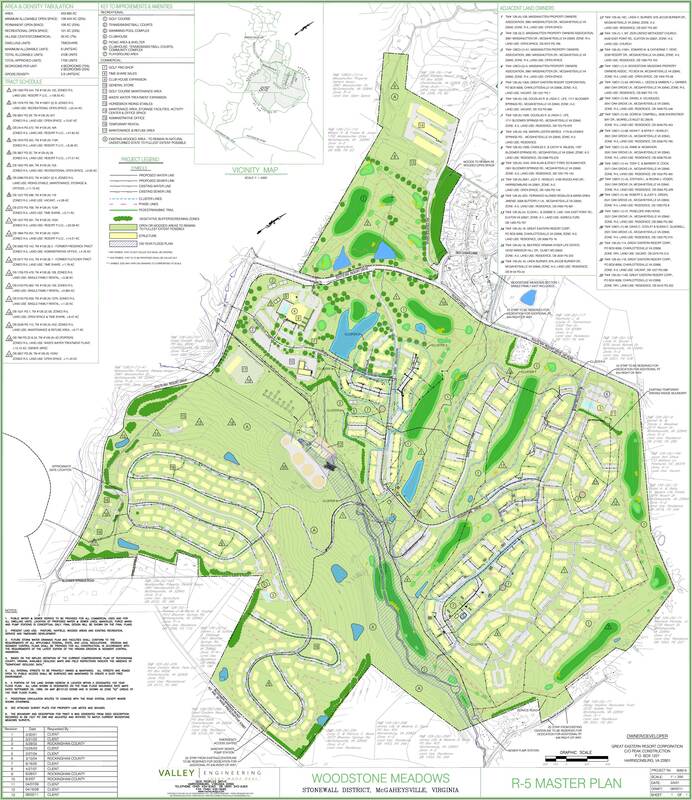 The six distinct areas described above which now comprises the Massanutten Community have all been master planned under the Rockingham County Zoning Ordinance and approved by the County Supervisors. This means that almost all zoning has been established and traffic patterns have been planned. Despite the fact that the construction schedule for the proposed areas will likely take many years to complete, the Massanutten area has a well established zoning base. If it were to incorporate into a town, it would allow citizens of the community to control any rezoning of the well planned areas and control the zoning of any undeveloped areas. It should be noted that history has shown that the Massanutten area has undergone multiple, and some significant rezoning as time and needs dictated.